Trail mix is a great snack for on-the-go, outdoor enthusiasts like myself. I will often eat a small amount to fuel a hike or other outdoor activity. It's an energy packed snack that is quick, tasty and portable. Making my own trail mix allows me to control the ingredients and therefore the amount of calories and nutrition I get with each serving. Trail Mix is simply a combination of nuts, seeds, and dried fruit. What's fun is that you can mix & match ingredients for something different. I will often flavor my mix with extracts to give it a distinct taste; coconut being one of my favorites to use. Below is one of my go-to combinations but it can be changed up anyway you like. Have fun with it! Mix all the dry ingredients in a bowl. In another bowl stir together the oil & extracts until combined. Pour liquid mixture into the bowl with the dry ingredients and mix until everything is coated. Spread the mixture onto a lined baking sheet. Bake for about 20 minutes, stopping to shake the mixture around every 10 minutes. This is the perfect snack for sure! So yummy and with lots of crunch it's added to my must-make list! Pinned, too. Such a great snack. Great for lunches and road trips! I love anything with coconut flavor - love this! That is lovely trail mix! I love trail mix! I try to keep it in my bags at all times, this looks delicious! A perfect take-a-long for my long walks/hikes in the state park by me! Nom! These are perfect to bring to work... I always keep stuff like this in my drawer! This sounds great. My husband loves trail mix but with the ones I buy, there is always one ingredient he doesn't care for. This sounds like he'd eat it all up with no complaints! Homemade trail mix is the best! We always leave with a bag full of trail mix when heading out the door. Extra seeds and dried fruit for me! A great mix of everything I love and easy to boot! Sounds like the perfect snack! I love trail mix, it's so good. For me it's always perfection with coconut. So this one is perfect for me. Yum! Definitely need to pack some of this for on-the-go days! Trail mix is my favorite make at home snack! This version looks great! My tummy started growling when I was reading this! 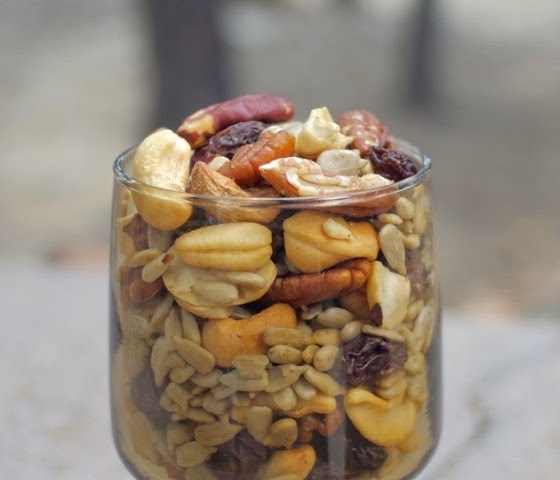 :D Your trail mix would be perfect for our day hikes! This is exactly the kind of trail mix we love - simple, without any questionable ingredients. Great for snacking anytime of the day! Love all these healthy nuts. I have coconut extract that I'm always looking for extra ways to use. Perfect snack! This sounds like a delicious trail mix, I love everything in it! Trail mix is perfect isn't it! Totally my go to snack! love this one!